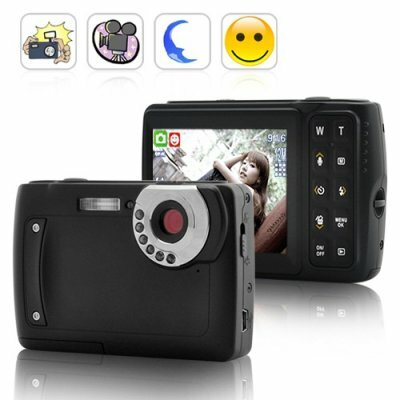 Successfully Added AbleCam 5MP Digital Camera - Night Vision Edition to your Shopping Cart. Capture sharp digital images and beautiful videos day and night with the AbleCam 5MP Night Vision Digital Camera. This special Nightvision Edition takes color photos at day and infrared photos by night, making it more than ideal for camping, scouting, and any other night time activities. With the AbleCam 5MP Digital Camera, the fun doesn't have to stop when the lights are out. Take beautiful, color pictures during day and then switch to IR night vision mode at night to take pictures in total darkness thanks to six infra-red lights! Ideal for late-night hang outs, camping, or even outside playing hide and seek, the AbleCam is the ultimate digital camera for use at any time of day! With a large display screen, easy one shoot button, and instant infra-red night vision, this is the ideal camera for any time of day. The AbleCam is in stock today, so get yours at an amazing factory direct wholesale price from the leaders in wholesale electronics, Chinavasion. Doesn't look flashy but looks are deceiving! This camera for the price is exceptional value for money! The night vision works great and the screen is big with clear image. It is also extremely light and you wouldn't know you had it in your pocket. 2 thumbs up chinavasion. Small camera appears well made. It can take sharp pictures at night without a flash to give it away. In IR mode pictures are black and white. Can record video as well and since its small it can go in your shirts pocket. I recommend it to the gadget lover who wants night vision.